EARTH A New Wild is a five-part series taking a fresh look at humankind’s relationship to the planet’s wildest places and most fascinating species. The adventure begins with back-to-back episodes Wednesday, February 4 at 8pm. Future episodes premiere Wednesdays at 9pm. Dr. M. Sanjayan, a leading conservation scientist, takes viewers on a stunning visual journey to explore how humans are inextricably woven into every aspect of the planet’s natural systems. The series features spectacular natural history footage from the most striking places on Earth, filming encounters between wild animals and the people who live and work with them. With up-close looks at a range of species, from giant pandas to humpback whales and African lions to Arctic reindeer, Sanjayan reveals that co-habitations with animals can work — and be mutually beneficial. This episode examines the relationship between humans and large animals on a 21st-century planet and asks if wild nature can still survive in what scientists now acknowledge is a new age for the planet — the Age of Man. Sequences include chimpanzees with Jane Goodall in Tanzania; man-eating tigers in the Sundarbans of Bangladesh; Giant panda in the highlands of China; and a segment that envisions what New York City would look like if nature took over completely. From the African plains to the American Midwest, this episode explores wild grasslands — home to the greatest gathering places of animal life on the planet, yet among the most endangered places on Earth – requiring hoofs and jaws to thrive. The program introduces Alan Savory and film sequences including elephant conservation in South Africa; the first filmed shots of rutting Saiga antelope in Russia; Norwegian locals regulating the reindeer population in unique ways; and how Americans are saving the country’s most-endangered mammal. Sanjayan travels deep into the western most Amazon to a place scientists believe may be the most bio-diverse on earth, still holding the secrets of un-contacted tribes. From here, he reveals a new understanding about humans’ relationship with the forests of the world. Sequences include the first filmed scientific trip to Ecuador’s Intangible Zone; unique behavior, filmed for the first time, of wolves in the Great Bear Rainforest of British Columbia; eagles and Iberian lynx in the cork forests of Europe, and frightening elephant battles in the forests of Indonesia. This episode introduces Jeremy Jackson, whose seminal paper “The Rise of Slime” dramatically changed the way scientists look at our relationship with the Earth’s oceans. Sequences include a mass gathering of fearsome ocean predators at the most pristine coral atoll on earth; a shark birth and migrations off the coast of Florida; coral gardeners in Australia; and futuristic offshore fish farms in Mexico. 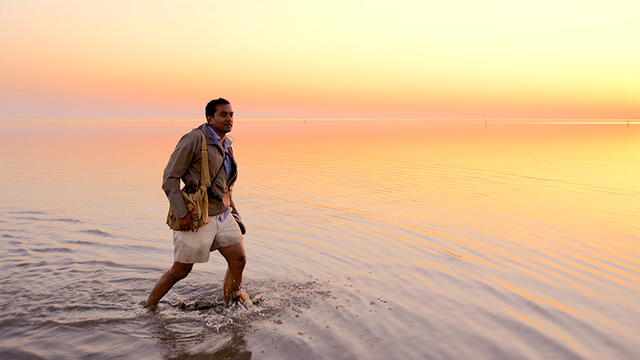 Sanjayan explores humankind’s relationship with the Earth’s most important resource, unraveling dramatic connections between the pulse of fresh water and the health of the planet. In North America, an epic kayak journey charting the flow of the once-mighty Colorado River ends in an unlikely ray of hope. Sequences include: the singing wells of Kenya; the connection between AIDS and a small fish in Lake Malawi; a clandestine visit to the biggest environmental disaster on the planet; and a look at how hunters in America saved one of the greatest gatherings of birds on the continent.